The Donna E. Shalala MusicReach Mentorship Program uses music as a motivating tool to provide children and teens in the Miami-Dade County with positive life choices and a gateway for higher education. 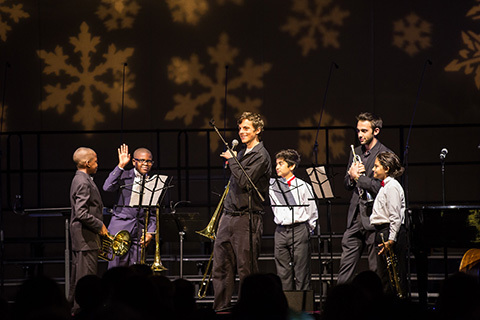 The program collaborates with local schools, afterschool programs, and the Greater Miami Youth Symphony. The 2-1 Mentoring program provides safe and fun music instruction on the University of Miami’s Coral Gables campus and at the Historic Hampton House for motivated middle schoolers from the Miami-Dade County, pairing them with freshmen music majors from the Frost School of Music who mentor them for four years. Additional programming takes place onsite at numerous public schools and youth centers. Frost Director of Outreach, Dr. Melissa Lesniak, supervises all activities. Proceeds from this year’s Winter Wonderful event will help provide scholarships for new teaching mentors, inspiring even more new young people toward their pursuit of excellence. All participating Frost students receive mentoring training and their activities are supervised by Frost School’s outreach director Dr. Melissa Lesniak.